Thought this might be a good resource here. There are others so if you find one you think is good, post it here! Comparisons can't be valid when many of the rim size listings are as much as .020" wrong. I have no idea where some of the manufacturers came up with their numbers. And then they get repeated endlessly on charts like these. • Accurate - hardly (especially with so much sample-to-sample variation within any given mouthpiece designation). ...¤ Particularly unreliable with regard to Cup I.D., where there is no standard way / place to measure this dimension. ...¤ Listed Throat diameters are a little better (usually accurate with one drill size). • Helpful - sort of. At least these charts generally display the different manufacturers' numbering systems and relative sizes within a given system and roughly from one manufacturer to another. Mpc charts often only list rim sizes—they rarely list other common variables. Doug’s mouthpiece charts are an exception: his charts list cup depths, as well. Some, like Greg Black, list other common variables, like drill or reamer size. But there are so many other variables to the size and shape of a mouthpiece that it’s impossible to know ahead of time whether the typical example of model X from maker Y will work well with person Z. And that’s to say nothing about whether the typical example of model X from maker Y will be the same or roughly the same in 1, 5, 10, or 20 years. The .020 discrepancy that 's so prevalent in those charts pretty much puts some mouthpieces in a different ballpark. Many players are sensitive to a .005 difference. I can offer some experience going wrong from "comparison charts". I generally play 1.02" (Bach 4) rims. I bought a Marcinkiewicz 8H, which was supposed to be the same size. It was too small. Then I see them label it 8H-6.5AL. That's about the size it really was. I found the Kanstul Mouthpiece Comparator very useful, but it was only for trumpet 'pieces. That's the only really valid way to compare if you don' have them all at hand. A lot of the mouthpiece makers offer some kind of comparison chart. They’re not terrible, but there are errors. I think a more useful comparison chart would be group-sourced by players, saying which mouthpieces play and feel like others of approximate similar size. Maybe... . On the other hand, agreeing to criteria could be tough. And then you have to factor in the instrument. I don't think you can establish criteria precisely enough to be of significant value. As Doug Elliott has pointed out on more than one occasion, you're dealing with complex curves on 3-D surfaces. This in itself introduces substantial issues in deciding what to compare and how to compare it, and what those comparisons might mean. Then introduce the variations of the players own facial/dental structure, and what can you expect? It might be regarded as an interesting academic exercise in modeling, but beyond that I doubt that you'd get much more practical value than what we have now. Maybe just 3-D diagrams with dimensions would be as good as anything else. Anyone sufficiently involved with manufacturing technology to know the current level of precision of an affordable laser scanner? The data for the Kanstul Mouthpiece Comparator was compiled from scans done on a coordinate measuring machine. CMM time is pretty expensive. For criteria for comparison, I was thinking of more subjective things, such as bright vs. dark, bite is sharp or soft, diameter feels pretty much like Bach #... An example: Curry 6C feels to me like a slightly large Bach 7C, with a softer bite. It's got a nice ringing tone on the bright side. On my .500 bore tenor, I get from pedal Bb to 3 octaves above. Have to start working for upper register about E above Middle C. I think that kind of comparison may be more useful player to player. YMMV. When there's as much as .020 of an inch measurable difference in rim size between samples of the same mouthpiece, or that far away from the published specs, there's not a lot of point in assuming any kind of reliability of any chart. Some of the published specs are laughable. What do you think of subjective comparisons of sound and feel? Is there too much variation from player to player and horn to horn? For most players, the typical variation between samples (and/or variation from published specs) of mouthpieces by some of the relatively major manufacturers is enough to make the difference between playable and unplayable. What use is somebody's opinion of their particular mouthpiece when is has almost no resemblance to another marked wit the same number? And a "5G" by one maker is barely related to a Bach 5G, where the number came from. Funnily enough, my dad and I both have Edwards .525/547 slides. His measures .522, mine is .525. Hooray consistency! The problem with subjective criteria is that they're ... er ... subjective. And yet the whole point of this is to get some comparison that is meaningful to all players -- so not subjective. You can't even get a good non-subjective comparison of what "bright", "dark", "sharp bite", "soft bight", etc. are -- precisely because these are subjective evaluations. So then the best you could hope for is a kind of "consensus" comparison. Then in order to use that consensus comparison you have to decide where you stand individually with respect to those who are in the consensus and those who aren't. And exactly how do you do that? This is pretty much what we have today -- with multiple mouthpiece charts where the chart-maker is either expressing his own opinion or parroting the description of someone else (player, manufacturer, ...). And we see the huge variation in this and how people often disagree with even the simplist comparison (It's very similar to a 1.5G. No, it's not, it's more like a 1.25G. Not, it's not, ...). So it all turns into a real "ballpark" kind of description with a wide variance of acceptance and usefulness -- because of the subjectivity. Not totally without value perhaps. But not something on the basis of which you can make a confident decision. At best, something that you can use to narrow down what pieces you want to try. This is pretty much what we have today -- At best, something that you can use to narrow down what pieces you want to try. That’s my point. Mouthpiece makers don’t have a universal standard for taking measurements, and samples can be inconsistent. But although players differ both physically and in terms of how they interpret terms such as bright and dark, there is enough commonality that a significant proportion of players will have a similar experience with the same make and model of mouthpiece. Otherwise, why would so many people play a 6.5 AL? Even if makers did adopt a universal measurement standard and we all agreed on exact acoustical reference points for “bright” and “dark”, I am quite sure that no mouthpiece comparison chart would ever be more than a ballpark guide for most of us. And since it’s unlikely that we will ever get all the mouthpiece makers to agree on a universal standard, subjective evaluations become relatively more useful. Have a mouthpiece that feels too small? Too big? Bite is too sharp? Tone is blatty or colorless or muffled or brilliant? Those are all subjective criteria on which we base our (hopefully) final selections. Ever have a teacher or a section mate suggest a mouthpiece to try, and maybe it worked out and maybe it didn’t, but you narrowed down your search? Same thing. Maybe an answer is to have a set of measurement tools, with dimensions agreed by the manufactures that give a visual guide to the sizes, rather than a numeral one. Otherwise, why would so many people play a 6.5 AL? I don't know. Why would so many tuba players play a 24AW -- which is also generally agreed to be dreadful? There are a number of answers to questions like this, and often they don't have to do with the actual features of the mouthpiece and comparisons of it to others which most people haven't even tried. Except, that is going backwards. That is going back to pre-industrialized ways of measurement. What we need more is just a better use of available measurement tools. As silly as it is, Taking a 1" Gage disc (think a quarter) and seeing how far down it sits from the highest point of the rim will tell you more about a lot of pieces than the printed dimension. I guarantee that the printed measurement exists on that rim someplace, we just want to know more about where and how they measured it. If we agree to use discs and report the depths, that would tell us a lot more than some guy with a caliper filling out a chart randomly. Doug brings in another point, the precision of how closely each example matches each other. How repeatable are they? The technology to make them match exists well, but without a defined place and method to measure, they will vary as much as the measurement method. What we need more is just a better use of available measurement tools. As silly as it is, Taking a 1" Gage disc (think a quarter) and seeing how far down it sits from the highest point of the rim will tell you more about a lot of pieces than the printed dimension. This what I mean. In the UK using a 10p coin is a good way to judge the width of a m/p, coins are made to a rigid standard. Add a pencil and a few drill bits for the bore/backbore. When I'm with other trombonists and curious about their m/p I get a coin out and my "QE2 bingo pencil" to get a rough idea of it's dimensions, without imbibing someones cold germs etc.. When I get around to selling any of my spare 'pieces on eBay I'll know that a picture with this coin sitting on top of the m/p is going to be (in the uk) a good indicator of its rim size to the potential buyer. This put it in perspecdtive for me. Thanks Doug. I forgot my mouthpiece the other day and the only other mouthpiece in my case was a Bach 4G. I would really like to know what Bach 4G this was because it really didn't feel any different than my 1.06" rim... I didn't even realize until after the sectional was over that I was playing on a different mouthpiece. Valuable info, Bruce. I swear the manufacturer (Marcy) regularly mixes up the left-right columns on their charts. Mouthpiece Express accurately lists Bach comparables, along with the same mixed up data that Marcy uses...at least the comparables are pretty much correct. I really like Marcinckiewicz mps, but I can't make much sense out of their measurements compared to others or even compared to other Marc mps on the chart. I just know that I like the 8H on small bore, the 4 on large bore and the 3 on bass. When my bass chops get stronger, I'm likely to try one of their larger bass mps. I think their strange measurements may have kept some from trying a very good line of mps. People feel different, differently on any given day of the year. Its part of the music game. So measurements are kinda irrelevant and seems to be on the moot side. Go with that dose not hurt you is my game. I've come to terms that the "Mouth Piece Game" is expensive and requires lots of trial and error, some personal time, and a little anger to come to some efficacy. I just measured the inside diameter of the Marcinkiewicz 8HL 6.5AL, tough because of the rounded inside rim, and is was ever so slightly off 26 mm, 25.9...a small 4 would be the best estimate.Their website states it is 26.13. The cup, though, has even a bit less depth than a Bach 6.5AL! It's very shallow. Bottom-line is that I think it plays much more like a well-rounded rim Schilke 51B in my opinion. Very bright. Forget the valve range, i.e. F attachment E through C with this piece, but to be fair any very small cup mouthpiece is a no-go in this area anyway. Very Good for higher register, slower stuff, though. Hammond 11M, which comes with a large standard symphonic backbore, provides a much fuller sound vs a nasal effect (sometimes) with the Marcinkiewicz. Again, just an quick read based on my specific equipment and embouchure. Last edited by jph on Tue Feb 26, 2019 3:06 pm, edited 1 time in total. Years ago I went from a Bach 6 1/2 AL to a Marc 8H and the transition in size was not a problem. Felt about the szme, but I liked the rim shape a whole lot better on the Marc. The Backbore is bigger, though because I can put out much more sound on my Conn 48h with the Marc 8H than the Bach 6 1/2 AL. Marcs are funny mps in their sizing though. I have a 4 that I use on my large bore and a 3 that I use on my bass bone and there's a huge gap between them. The 4 is just a tad bigger, although a bit shallower cup and smaller throat, than my UMI 5G that I also use on the large bore while the Marc 3 is about a Bach 2 size-- it's just a tad smaller than the Bach 1 1/2 G bass bone mp and clearly has a bass bone throat and backbore. The Marc 8H 6.5AL might be a bit more funnel-shaped than the Bach 6.5AL, and it is lighter in weight. 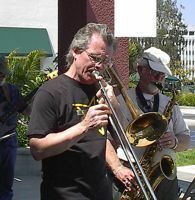 Nonetheless, it is one of the few 4-sized large shank offered mouthpieces (at approx. 1.02 inches, 25.9mm) that does not have an ample cup. I'd call it a 1.02, D+ cup, using the Elliott system, for the Comparison Chart. It is good for delicate situations where you do want responsiveness, but do not want the darkness, openness and extra air requirements that a symphonic backbore can bring. I use the Marc 8H/6.5AL on parts that stay in the upper register of the orchestral trombone. For general all around symphonic tenor playing I use a Marc 5GW, or a Conn Remmington, or a Holton Haney LBT, or a Maurice Bentafa (sp??) TRG (wooden!). All the general pieces are similar in size but different in composition, throat, etc. The one I use just depends on the piece of music I am playing, and how I feel at the time! Very scientific! But, I get no complaints! Yes, a dedicated high-register piece. Great on Keith Brown's The Swan, for instance. It can sing. Seems physical measurements like rim width could be misleading and not comparable in some ways. My wife and I recently got new wedding rings. Mine went from a narrowish band with a rounded inner contour to a wide one with a flat inner contour. Using a ring measuring stick, it was easy to see the old one had gotten small, so we ordered that size in the new ring. When it arrived, it was impossibly tight. Why? Not sure. The contour has something to do with it. The sharp initial edge may have a lot to do with it. I notice the measuring rings we used had rounded inner contour. So trying various other sizing rings, it seemed trying for TWO SIZES larger was thing to do. It arrived and is perfect. I would expect then that two pieces of the same rim inner diameter could feel and behave vastly different depending on the contour of the cushion area and how it curves in to the rim diameter. So comparison charts seem like very rough guidance only.